Easter is known as Pascha, Passover, Feast of the Resurrection, Sunday of the Resurrection and Resurrection Day. It is celebrated in late March to April in the western world and early April to early May in the Eastern Orthodox Christianity. Easter is the holiest holiday of the year for Christians around the world. It celebrates the resurrection of Jesus Christ, the Messiah of the Christian faith. Because the Bible says that Jesus rose from the dead three days after his crucifixion, Easter is celebrated by Western Christians on Sunday. Good Friday is recognized as the occurrence of His death by crucifixion around 33 A.D. The actual date of Jesus' crucifixion and resurrection have been argued among Christians and Catholics. Some say it should be celebrated on the 14th of Nisan using the Old Testament's Hebrew calendar. This makes it difficult to celebrate because the 14th of Nisan is determined by the moon and could fall on any day of the week. Although the Passover at the time of Jesus' death was on the 14th of Nisan, Easter is always celebrated by Western Christians on a Sunday, the day of worship for modern Christians. Easter Sunday is the first Sunday following a full moon after March 21. Early Christians did not celebrate Easter. They followed Jewish customs and celebrated Passover. They also followed the Hebrew calendar. Most believe Easter was a celebration invented by the Church of Rome to transform a pagan holiday, Eostre, into a Christian celebration. The Church of Rome adopted the Julian calendar and some western churches adopted the Gregorian calendar to calculate the date. To this day, the date is celebrated on different dates by both eastern and western Christians. Because Jesus was crucified at the time of the Passover, a Jewish holiday, the holiday is derived from the the Hebrew, Pesach, which means Passover. 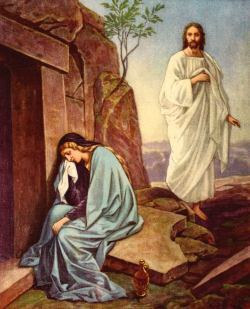 However, the English name of "Easter" is taken from a Saxon goddess named Eostre who was celebrated at about that time. The legend is that Eostre gave a rabbit friend the power to lay eggs once a year on the Spring Equinox. The eggs symbolized new beginnings and the rabbit symbolized fertility. Initially, because the egg was a symbol of Eostre, the Catholic Church forbid the use of eggs during Lent. As was common, the Catholic Church took pagan holidays and transformed them into religious holidays in an attempt to convert pagans to Catholicism. To Roman Catholics, Easter marks the end of the forty days of Lent, a period of fasting and penitence in preparation for Easter. Lent begins on Ash Wednesday. To all western Christians, the Sunday before Easter is called Palm Sunday, the Thursday before is called Maundy Thursday (Holy Thursday), and the Friday before is called Good Friday. Palm Sunday celebrates the time when Jesus entered Jerusalem on a donkey. When he entered, people worshiped him and placed palm leaves on the ground before Him. Good Friday marks Jesus' crucifixion. To eastern Christians, preparation for Easter begins with Great Lent. After the fifth Sunday of Great Lent, the following week is called Palm Week and ends with Lazarus Saturday. Lazarus Saturday is the last day of Great Lent. The day after Lazarus Saturday is Palm Sunday. Palm Sunday marks the beginning of Holy Week. Pascha (Easter) marks the end of Holy Week. On that day, they end their fasting with a Divine Liturgy. The following week is called Bright Week. Roman Catholics celebrate Easter beginning on Holy Saturday with the Easter Vigil, the most important liturgy of the year. It begins in darkness with the blessing of the Easter fire, the lighting of the Paschal candle. The Paschal candle symbolizes the risen Christ. Easter is considered the perfect time to receive baptism and membership in the Church. The Easter Vigil ends with the celebration of the Eucharist, or Holy Communion. Protestants call the Eucharist "communion" and welcome anyone to celebrate. The morning of Easter, Catholics bring large statues of Jesus and Mary together to "meet." This represents Jesus' mother, Mary, meeting for the first time since the resurrection. They conclude with Easter Mass. Protestants usually begin celebrations with an Easter "Sonrise" service [A play on words for the Son of God]. It begins with a breakfast that represents the time the women came to visit Jesus' tomb at dawn. Many Easter Sunrise services are held outdoors on the church's lawn or a park. Easter Lillies decorate the church and festive hymns are sung. Many Christians dress up on Easter Sunday with women wearing hats and dresses with lace. Churches across America report that they have the highest church attendance of the year on Easter Sunday. The Passover is observed by both Christians and Jews alike. In the Torah (Old Testament) or the book of Exodus, God told the enslaved Israelites to mark their door posts with lamb's blood in order to spare them the slaughter that was about to strike Egypt. When God would see the blood, he would "pass over" the home and spare the occupants. This was the final plague inflicted on Egypt as a result of Ramses II, the Pharaoh, refusing to free the Israelites. After the first-born Egyptians died, Ramses reluctantly released the Israelites. Later, the entire Egyptian army perished while crossing the Dead Sea as they were chasing the Israelites. To this day, Jews and many Christians remember this event in what is known as the Passover. Because the Israelites were in a hurry to leave Egypt, they didn't have time to take dough that would rise and later be baked. They took raw dough that was baked in the hot desert sun. These became like hard crackers and are called Matzohs. Matzohs are eaten during the Passover celebration. The most important part of the celebration is the Passover Seder. Seder means "order" in Hebrew and are observed the first two nights of the eight-day event. The Seder includes great meals, special foods, stories from the book of Exodus, songs, and prayers. Leavened foods are not allowed, and only kosher food is eaten. Three pieces of Matzohs are placed on the table. The middle one is broken before the meal. Half is returned to the table and the other half is hidden. Children hunt for the hidden piece after the meal and whoever finds it gets an award. Four cups of wine are drunk to represent the four states of Exodus. Because Easter was originally a Pagan holiday, there are many non-religious traditions. Favorite Easter food includes chocolate Easter eggs, jelly beans, Peeps, and marshmallow and chocolate bunnies. In America, Easter eggs are typically decorated on Saturday and hunted on Sunday. Americans hide these eggs around their homes and gardens. Some locations have community Easter egg hunts. Some parents tell their children that the eggs have been hidden by the Easter bunny. Why the bunny would ever hide these eggs is unclear. Most historians say the the reason for the use of eggs and a bunny for Easter is because the egg represented the goddess Eostre. Eostre could also take the form of a hare. In the 17th century, people hunted rabbits on Good Friday. In Norway, they ski in the mountains and paint eggs. They love to solve murders on Easter and most of their television shows are crime and detective stories. Milk cartons have murder mystery stories on them. They like to play Yahtzee. In Finland and Sweden the children dress as witches and warlocks and collect candy door-to-door as with Halloween in the United States. In the Netherlands, fires are lit at sunset on Easter. Here we see the Pomlazka in action. The men are whipping the legs of the women. Perhaps the most bizarre traditions on Easter are carried out by the Czech Republic, Hungary and Slovakia. 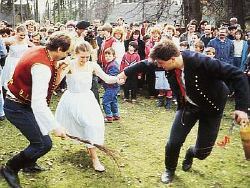 Easter morning the young men and boys douse the girls with water and whip them with a handmade whip called the pomlazka (Archive - Called a korbac in Slovakia and Śmigus-dyngus in Poland). The purpose of this is for men to show their attraction to women and to have good luck with the upcoming harvest (No word on how whipping illustrates attraction toward women). The whipped female then gives a decorated egg called a kraslice to the male as a sign of thankfulness. (Perhaps thankful he quit whipping her) They then tie a ribbon to the boy's whip. The more ribbons on their whips, the prouder the boys are. The girls will save the best egg for the boy they have the most interest in. In some areas, the women get revenge in the afternoon by pouring a bucket of cold water on the men. Older men are given Třešňovice, a cherry brandy, instead of eggs. Fabergé Easter Eggs - An IAD lesson on ceramic Russian Easter Eggs. Easter Crafts (Archive) by Kaboose. See an older archive of the site when it was known as Kids Domain. Pysanky (Archive) an egg decorating tradition with lessons from the Ukraine. The Real Easter Story: An In-Depth Study for the Whole Family - A PDF document with a crossword puzzle, word search, word scramble, and recipes. (Found on pages 23-34) Compliments of the Old Schoolhouse Magazine.